The easiest place to add at HTML code, for adsense or other reasons, is in any forum or sub-forum Description area. Just check the "Description is in HTML Format" box. If you want to add it elsewhere then you need to learn how to edit the NAML macros that generate Nabble's pages. I had no idea this was so easy this is very useful to me I got it to work on the forum home page, but when I post it in the sub forums even with the HTML box checked I don't get an ad I get the code showing through. any ideas? 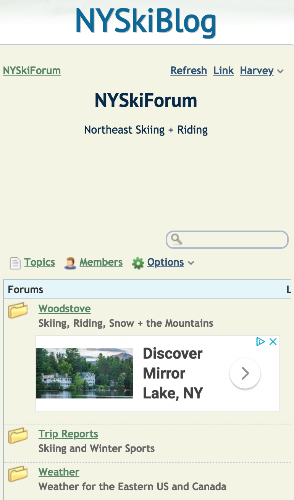 The idea of using the forum description area is great. I'm only using it at the top level because in sub forums it shows on the main page, like in the image above. Any way to prevent this? If I could use an ad at the top of each sub forum that would be great. Any code for this? None of my forums are commercial so I don't use adverts on any of them and hadn't tested my suggestion, but now I think about it, adding adsense code to the Description Area will have problems with the Category app and others that display the Description Area contents for sub-forums. When I get home from the trip I am currently on will see if anything I can think of works. At the moment my hope is that it I can use a CSS class that detects the different structure on pages listing sub-forums and when used in that context sets the advert not to display. NOTE: Having the description to display as a paragraph (within "p" tags) defaults to showing a 1em margin under the paragraph. That may not be desirable on the top level app unless all sub-forum descriptions are set to be HTML and also include "p" tags. Also, depending how the adsense code is written, it may be preferable to dispense with the "p" tags in the description.